CAMP PERRY, OHIO – Junior shooters beware, there’s trouble brewing in Arizona and it looks like it’s just beginning to reach a boil. Tyler Rico, 14, of Tucson and his partner Andrew Swazey, 18, of Phoenix just added the Whistler Boy Highpower Trophy to their growing list of recent accomplishments at the National Trophy Matches on Wednesday, 30 July. While Swazey is well along in his junior career, Rico is just getting started and what a start it is. 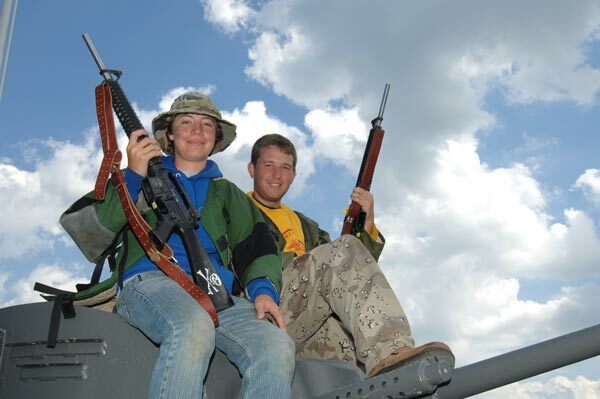 Rico became the youngest Distinguished Rifleman ever last year. He legged out at 13 years, five months and 15 days in November 2007, and is both the youngest male and youngest recipient of the award. Gunny R. Lee Ermey poses with the Arizona Juniors after the Rifle Awards Ceremony Friday evening. Rico also made the President’s 100 in service rifle and just missed qualifying for the shoot-off, finishing 22nd. In the National Trophy Matches Whistler Boy Junior Team Match, the team of Rico and Swazey, shooting under the banner of Arizona Gold, scored a combined aggregate total of 964-24X, edging out defending Whistler Boy champion WSRPA (Washington State Rifle and Pistol Association) Bad Applettes-Shew (963-26X). Rico fired an unparalleled 197-5X in the 600-yard prone phase to put Arizona Gold on top. “I did decent at standing and didn’t blow up too bad at six,” Swazey added. He fired a 185-4X at 600, which was in middle of the Whistler Boy field. “I shot a seven and we still won, which was unexpected,” he said. The 500-point course of fire for the two-member team event is 10 shots standing at 200 yards, 10 shots rapid fire sitting at 200 yards, 10 shots rapid fire prone at 300 yards and 20 shots slow fire prone at 600 yards. 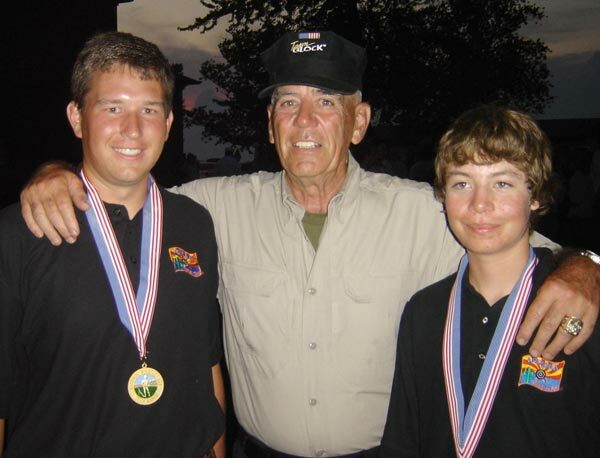 The Rico-Swazey team has been successfully competing together for about three years in their home state of Arizona. Rico says he’s been shooting his whole life recreationally. Swazey has been shooting for eight years overall. The pair was brought together at the state team matches and has become shooting partners and friends. “We finished second in the ‘rattle battle’ last year and hoped to win it this year,” Rico said. Arizona Gold placed second once more this year in the National Trophy Infantry Team match at the junior level to California Grizzlies. The top twenty Whistler Boy Teams received medallions from the CMP. Pictures can be viewed at http://www.odcmp.com/Photos/08/WB/index.htm and results are posted at http://clubs.odcmp.com/cgi-bin/report_matchResult.cgi?matchID=3426. 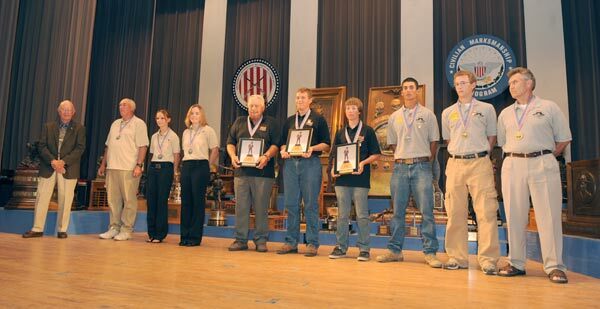 The top three Whistler Boy Teams were awarded medallions at the Rifle Awards Ceremony on Friday evening. The Arizona Juniors Gold Team was coached by John Wilder. WSRPA Bad Applettes – Shew Team of Jennifer Nyberg and Kelsi Unangst, coached by Jonathon Shew placed 2nd and Sir Walter Steen Team, Christopher Hudock and Mark Nations, coached by Kenneth Steen, placed 3rd.